Lung disease is at the center of much scientific research today. Courtesy of Buzzle. You have been coughing for over a month now, and your breath consistently shortens with every passing day. You go to see your doctor, who diagnoses you with Idiopathic Pulmonary Fibrosis (IPF), a disease with unknown cause and no known cure. Characterized by scarring and thickening of the lungs, IPF has been a cryptic phenomenon that proceeds at unpredictable rates to ultimately suffocate its victims. 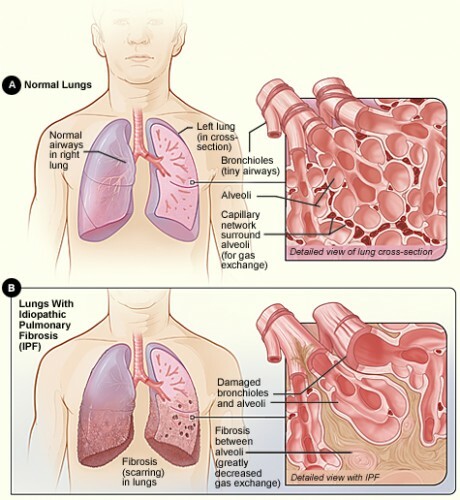 A comparison of normal and IPF-diseased lungs. Courtesy of National Institutes of Health. But a recent Yale-led study has dragged IPF into the limelight. Hypothesizing that a peripheral blood mononuclear cell’s gene expressions would predict IPF, just as they do with diseases like lung cancer, researchers have found that under-expression of 45 genes in the Biocarta pathway led to lower survival rates among patients who did not receive transplants. These genes – also known as “biomarkers” (DNA sequences that are associated with susceptibility to disease) – have their basis in decreased amounts of CD4+CD28+ T cells, which are responsible for immune activation against IPF. T-cells, the source of the Biocarta pathway genes, are seen here attacking a tumor. Courtesy of Steve Gschmeissner/Science Photo Library. Although the study still provides no cure for IPF, it assists optimal timing for treatment and avoids unnecessarily costly and inaccurate evaluations. Senior author of the paper Dr. Naftali Kaminski states, “The suggestion that a gene expression signature contains information beyond what could be gleaned by clinical testing and imaging is supporting the body of evidence that personalized medicine is not only for cancer – but also for chronic lung diseases.”  However, the study must wait for implementation in the clinic, a step that “would require at least one additional replication in a larger cohort and the development of an essay that is clinically valid,” says Dr. Kaminski. About the Author: Kevin Wang is a freshman in Ezra Stiles College and a prospective double major in Molecular Biophysics & Biochemistry and Humanities. Acknowledgements: The author would like to thank Dr. Kaminski for his time and for his enthusiasm about his research. Dr. Kaminski would like to acknowledge the outstanding contributions of Dr. Jose Herazo-Maya, the first author of the paper and third-year fellow at Yale School of Medicine.